This is somewhat of a surprise to me. 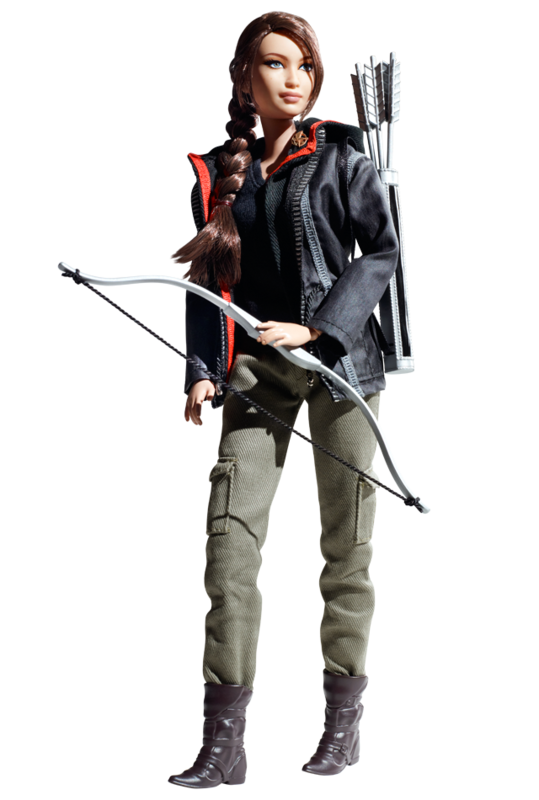 Obviously The Hunger Games has done all kinds of crazy things to previous box office records, and logic says there'd be a certain degree of merchandising - leaning to the more teenage/adult spectrum, surely - and thus I was NOT expecting a Katniss Barbie. Not in a million years. 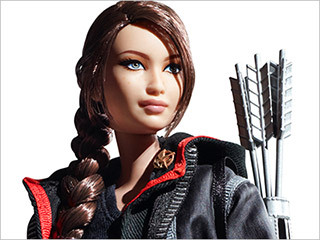 Broken on Entertainment Weekly, Mattel's Katniss Everdeen Barbie has been softened a good deal from the standard Barbie style/shape - while it's unclear if the body shape has been altered, it's at least been camouflaged a little with the costume and surprisingly sophisticated props. Though the feet are obviously still the Barbie Heel shape, thus why she appears to have been a victim of childhood footbinding. My initial WTF reaction has calmed a little and I'm actually rather impressed by this. That feeling may change when I see it in person - Mattel did some dreadful things to the Twilight dolls - but my first impressions are good. While I don't think it's a particularly close Jennifer Lawrence likeness, it's certainly not a Barbie likeness either and the midground is pretty appropriate. I approve of the braid. Could this be Barbies first pair of cargo pants? I certainly hope so. The collectors can put in a preorder for this one over here - limit of five per order though, sorry eBayers. Will it be a toy or art? A number of companies, like Ban Presto, can make these kinds of dolls into art, like Street Fighter's Chun Li Figures. Because these are from Mattel, they are most likely meant to be toys. But in time, are going to collectors' items.